I saw the narrow leaves with a white stripe when they came up under my raspberry bushes. I thought they might be crocuses, but the shape of the bulb wasn’t similar. I transplanted them to the new front walk bed last year. This year the number of plants increased and buds appeared. They are a lovely flower, only about an inch across. I have seen them before, but am blanking on the name. The blossom clusters remind me of species tulips. There were some of these by my back porch at the house on Newhall Street in Milwaukee, but they fell victim to children after blooming once. The columbines are not so full of flowers this spring, plus this one, the largest, appears to have been nibbled fairly heavily. Still a welcome sight in the spring. 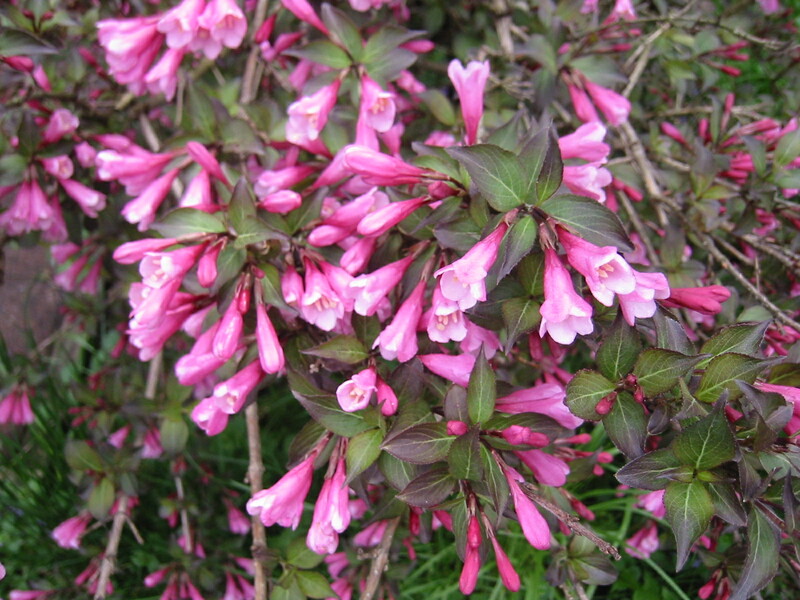 The Weigela (honeysuckle) bush is full of flowers now, but with the heavy rains the blossom-laden branches are drooping, so is not so showy as other years. 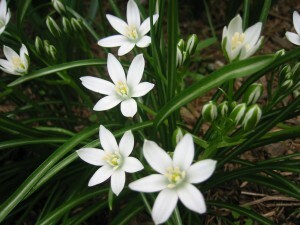 The branches have gotten quite long, so think after the blooms fade will need to prune it back a bit. I stopped at Brightmeyer’s Greenhouse on the way to the grocery store Tuesday last week. The scent probably started to draw me when I came in the door. I picked out pots of Italian parsley and basil, then lobelia (to provide blue flowers after the forget-me-nots fade). Got a four-pack of marigolds from a different section, then noticed the scent more strongly and saw the textured leaves and bunches of small dark purple flowers. When I looked at the label saw the magic words “sun or partial shade” so this year’s new plant is Marine Heliotrope. I planted the parsley and basil right away, then two of the marigolds. It is still a bit early (frost, shudder…), so I transplanted the remaining marigolds into pots. 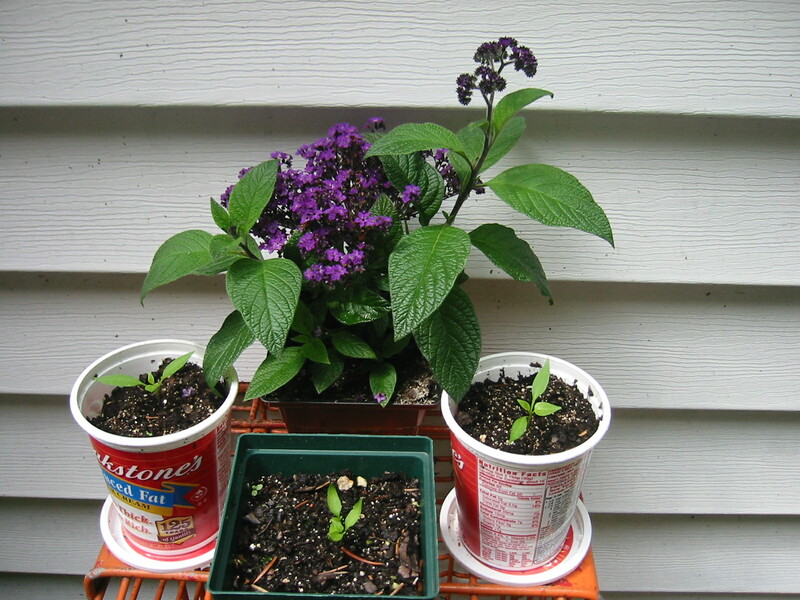 The heliotrope seems comfortable for now sitting with the chili pepper seedlings on the back deck. 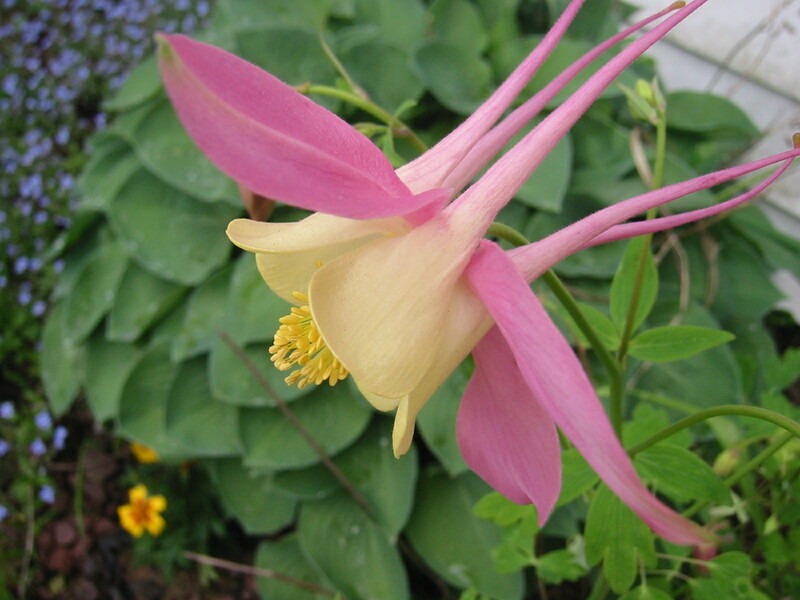 This entry was posted in Gardening, Photos and tagged bloom, columbine, flowers, May, spring. Bookmark the permalink. If you find out what the “mystery” flowers are, please let me know – I have tons of them in my yard and haven’t been able to identify them yet.